ITV has revealed that it plans to unleash its own video-on-demand (VOD) TV catch-up site on the web within weeks. The network also admitted that it had fallen woefully behind the BBC and Channel 4 in the online side of TV. 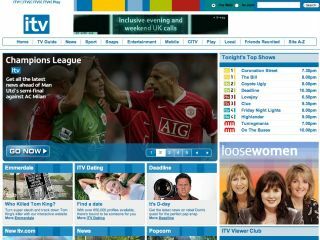 ITV has spent £20m on revamping ITV.com and will soon let you stream the channel live. An on-demand catch-up option is available for 30 days after each show's broadcast date. The Channel 4OD and BBC's iPlayer both only offer seven day catch-ups. To watch the ITV content on its website will require no software downloads like Channel 4 and BBC do. It'll be click and play. ITV says this system is easier for web users to get their heads around and would help the channel make more money from its online advertising. On Monday this week, the BBC 's governing body authorised the launch of its so-called BBC iPlayer, paving the way for on-demand downloads of BBC programmes. Channel 4 on the other hand has been streaming online for months, with its on-demand service going live earlier this year.